With hopes of a Michael Bloomberg independent candidacy still alive, I went over to West Medford to get a sense of how his hometown residents saw things. Conversations with a cross section of the neighborhood’s voters suggest that Mr. Bloomberg would have an uphill climb ahead of him. Most residents, many of whom are Democrats, were not interested in a Bloomberg candidacy. Others simply rolled their eyes or uttered “no” when asked if they would talk about Mr. Bloomberg’s presidential prospects. Although there are a sufficient amount of voters that said they don’t know enough about him to speculate what would happen if Mr. Bloomberg got into the race. One interesting footnote is that Medford’s mayor, Michael McGlynn, just switched his allegiance from John Edwards to Hillary Clinton. Why was McGlynn such a passionate Edwards supporter? His daughter Kathleen served as the chief of staff to Edwards’ campaign. Of Bloomberg, he says “He’s a guy who, if you look at him, has grown tremendously in that job.” “Right now, my allegiance is to Hillary, unless his mother calls me,” he added. Bloomberg at Harvard; New York Mayor Talks About Red Sox, Celtics and Braves! A native of Medford, he also addressed his status as a Boston sports fan. He recalled that he attended summer camp with the daughter of Warren Spahn, a legendary pitcher with the Boston Braves, currently playing in Atlanta, and said didn’t remember going to Fenway Park or Braves Field more than once or twice as a boy. His reference to the Braves actually buttressed his claim of lack of interest in local baseball because the fact that the Braves once played in Boston roughly two miles from Fenway Park is almost never talked about in public life. 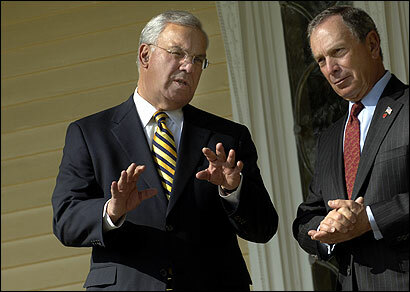 It really demonstrates how far Bloomberg is removed from Boston. Can you really imagine anybody around here talking about Warren Spahn and the Braves? I’ve mentioned Braves Field, today BU’s Nickerson Field, to relative newcomers to Boston. Most didn’t even realize that the Braves ever played here. Sox fans born after 1967 have no knowledge about the Braves and think the Red Sox always drew big crowds. He did admit to attending Boston Celtics games at the height of the Red Auerbach/Bill Russell championship era. Michael Bloomberg has garnered reams of press after having his name floated as a potential independent presidential candidate. Bloomberg, reportedly, is willing to spend $500 million on a presidential race. While money solves a lot of problems, it doesn’t do everything for the New York mayor. (With that said, it’s better to have $500 million, than not.) In my piece today in the New York Sun, I report on the myriad of practical difficulties that lie ahead of Bloomberg — despite the fact that he lacks what I call “the whiff of the weird” that usually accompanies third party candidates. “Mr. Bloomberg’s favor has plenty of money to throw at this chore, but that’s only part of the problem. He must find competent individuals who are unaffiliated with either of the major parties and who can devote time, energy, and passion to him. Independent candidacies are often the refuge of the extreme activist, the fringe enthusiast, and the agitator. I’d say Bloomberg’s organizational difficulties far outweigh the reigious issues.